This is a big update from the last time I looked into this, when I enumerated 57 Status Codes that Apache 2.x was capable of handling. This list contains 83 Status Codes that Apache recognizes. I compiled the latest 2.4.4 Apache in order to view the actual codes sent by a live server.. very cool. You can read about the newest HTTP Status Codes in RFC 6585. There are 4 main status code groups in Apache. They represent all the status codes from 100 to 600. Here is how IANA defineds them. These are the codes in a shell-script friendly fashion. Want to check the HTTP Headers? Use my Header Viewer. I recently added Hexdumps. I wrote a simple script to trigger all 83 Response Codes, using the super cool Htaccess Redirect/ErrorDocument trick, and saved the headers and body from each for your viewing pleasure. This is from Apache 2.4.4 for the 83 Status Codes. 300 (Multiple choices) The server has several actions available based on the request. The server may choose an action based on the requestor (user agent) or the server may present a list so the requestor can choose an action. 301 Moved Permanently This and all future requests should be directed to the given URI. 302 (Moved temporarily) The server is currently responding to the request with a page from a different location, but the requestor should continue to use the original location for future requests. This code is similar to a 301 in that for a GET or HEAD request, it automatically forwards the requestor to a different location, but you shouldn't use it to tell the Googlebot that a page or site has moved because Googlebot will continue to crawl and index the original location. 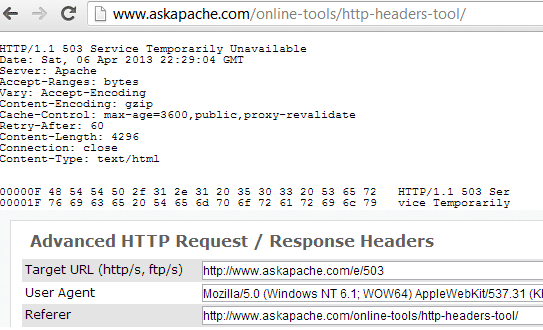 303 See Other (since HTTP/1.1) The response to the request can be found under another URI using a GET method. When received in response to a POST (or PUT/DELETE), it should be assumed that the server has received the data and the redirect should be issued with a separate GET message. The requested page hasn't been modified since the last request. When the server returns this response, it doesn't return the contents of the page. You should configure your server to return this response (called the If-Modified-Since HTTP header) when a page hasn't changed since the last time the requestor asked for it. This saves you bandwidth and overhead because your server can tell Googlebot that a page hasn't changed since the last time it was crawled. 305 Use Proxy (since HTTP/1.1) The requested resource is only available through a proxy, whose address is provided in the response. Many HTTP clients (such as Mozilla and Internet Explorer) do not correctly handle responses with this status code, primarily for security reasons. 306 Switch Proxy No longer used. Originally meant "Subsequent requests should use the specified proxy." 307 (Temporary redirect) The server is currently responding to the request with a page from a different location, but the requestor should continue to use the original location for future requests. This code is similar to a 301 in that for a GET or HEAD request, it automatically forwards the requestor to a different location, but you shouldn't use it to tell the Googlebot that a page or site has moved because Googlebot will continue to crawl and index the original location. 308 (Permanent redirect) The target resource has been assigned a new permanent URI and any future references to this resource SHOULD use one of the returned URIs. Clients with link editing capabilities ought to automatically re-link references to the effective request URI to one or more of the new references returned by the server, where possible. Caches MAY use a heuristic to determine freshness for 308 responses. The new permanent URI SHOULD be given by the Location field in the response. A response payload can contain a short hypertext note with a hyperlink to the new URI(s). Note: This status code is similar to 301 Moved Permanently, except that it does not allow rewriting the request method from POST to GET. 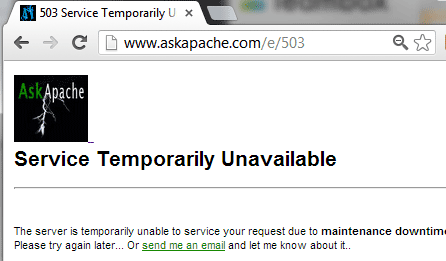 is no longer available on this server and there is no forwarding address. the request exceeds the capacity limit. field was not presented by the client. Success Codes: 209, 210, 211, 212, 213, 214, 215, 216, 217, 218, 219, 220, 221, 222, 223, 224, 225 are all currently unsupported. Redirect Codes: 300, 301, 302, 303, 304, 305, 306, 307, 308, all returned the correct ErrorDocument but due to the updates to Apache they then continue through and return the redirect url (issuing 404) instead of the actual 3xx (codes). Now they correctly redirect basically, whereas in earlier versions you could trick Apache into sending the Headers and ErrorDocument specific to the 3xx. No biggie, everyone knows the 3xx. Client Error Codes: 418, 419, 420, 421, 425, 427, 430 currently unsupported. Server Error Code: 509 currently unsupported. Basically just save this as your .htaccess file. Then when you request, /e/503, it will trigger a 503 response. Took me a long time to come up with this trick btw.. More info about this ErrorDocument triggering trick. Then I compiled the latest 2.4.4 Apache HTTPD from source and set it up on a staging server in order to get the newest Apache responses. The 2.2 Apaches and below had 57 codes vs 2.4.4 has 83. Just a simple shell script you can run from Bash after setting up the Htaccess Triggering. This just loops through all 83 Codes and requests the special uri that causes Apache to respond with the HTTP Status Code and Relevant ErrorDocument. The rest of the 83 Codes are NULL for future use. Test 3xx Redirection Capabilities of your browser. Thanks to green bytes! Apache drops the connection for these codes. Probably my all time favorite, from Wireshark. This type of table is used by software like WordPress, Zend, Snoopy, Curl, you name it. Always good to update. RFC 2295 - Transparent Content Negotiation in HTTP, March 1998. RFC 2518 - HTTP Extensions for Distributed Authoring -- WEBDAV, February 1999. RFC 2616 - Hypertext Transfer Protocol -- HTTP/1.1, June 1999. RFC 2774 - An HTTP Extension Framework, February 2000. RFC 2817 - Upgrading to TLS Within HTTP/1.1, May 2000. RFC 3229 - Delta encoding in HTTP, January 2002. RFC 4918 - HTTP Extensions for Web Distributed Authoring and Versioning (WebDAV), June 2007.